Remodeling and Rennovation News and Advise brought to you by Moore Home Remodeling, experts in the home remodeling. Dress up new kitchen cabinetry with LED lighting. Call Haas Cabinet Dealer and General Contractor, Moore Home Remodeling for your Northeast Ohio kitchen renovation Project. Contactors should ask about special contractor pricing. A: That’s an excellent question and one that we get a lot. I recently saw a show that listed the cost for granite at $500. As much as I wish that were possible, it just isn’t. I think there was a zero missing. Granite is a high-end item, but keep in mind that what you see on TV is often for ratings and entertainment value and is not based on reality. Additionally, the designers on TV might be getting an unheard of deal, especially if he or she is showcasing a supplier’s goods in exchange for advertising. They also aren’t including the cost for labor and fabricating, or, if they are, those costs might be specific to a particular area. As a Haas Cabinet Dealer and General Contractor, we can supply your cabinets, plan your project and install everything or you can have your contractor/installer purchase them and install them. And, on the TV shows, they don’t seem to have to deal with local codes, which, like it or not, are a part of most remodeling projects. We recently finished a project that was started by a do-it-yourselfer. With no plan for a design or budget, he jumped into it expecting to have it done fast—and cheap. It could have been far worse had he not realized that he was in over his head. Electrical issues, plumbing issues and wasted money on product that did not work for his project all could have been avoided. In the end, the remodeling project cost him more time and money than if he would have gone with a professional design-build firm in the first place. His wife wasn’t very happy, either. At Moore Home Remodeling, most of our projects do not involve the use of box-store shelf items, so applying a price tag in that manner doesn’t work either. Proper renovations require planning and budgeting for the best outcomes. Our crew of remodeling professionals includes experts in their fields, which can end up saving a lot of time and money. Call us and let us know how we can help you get the designer look you’re going for—in a real-world setting. You can learn more about the difference a design-build firm like Moore Home Remodeling can offer by calling Brent Moore at 440-941-4MHR (4647). The web address is www.MooreRemodeling.com. You’ve decided to go ahead and have your kitchen renovated, but the excitement of the project is dampened by two little glitches. Who’s going to design it, and, who’s going to do the work? It’s not an insurmountable challenge to hire a remodeling professional. But it’s trickier to find a professional who understands the design behind the finished project and then has at his disposal a team of trusted tradesmen who enter and exit your project like a well-choreographed dance troupe. Brent Moore, owner of Moore Home Remodeling, says that hiring a design build firm is crucial to getting the result you’re looking for. Diana Phillips helps to guide clients through the myriad of product choices. For additions, in-house residential designer Brian is there every step the way. 1) The process starts when you call. The MHR team begins gathering relevant information, making suggestions, and educating homeowners from the very first call. 2) Then, after a complimentary, professional consultation, they’re better able to determine if the project will fit within the desired investment amount and a cost range is developed. 3) Now comes the design phase. The team will create a plan that matches your vision. They’ll even craft a 3-D computer generated visual so you can really experience the look of your new space. During this phase, you will also make your selections and nail down the project cost—a crucial step toward preventing surprises in the end. 4) Once all of the selections have been made and the numbers have been tallied, you’ll sign a contract and the work begins. Brent provides his clients with access to quality products, like the Haas line of cabinets. “The Haas family has been in business for three generations,” he explains. You can learn more about the difference a design-build firm like Moore Home Remodeling can offer by calling Brent Moore at 440-941-4MHR (4647). The web address is http://www.MooreRemodeling.com. A: Great question. Many people are choosing to stay in their current homes because they like their neighbors, location, schools, and more. Today, it often makes more sense to make your current home your dream home. The design time frame varies from one home to another because each is so different. Remodeling—including additions—is completely custom work. 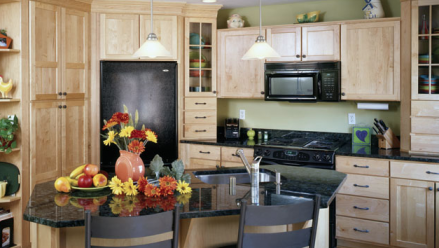 At Moore Home Remodeling, we aim to create a concept three to four weeks after an initial meeting. We will come up with a few ideas that sometimes merge to or inspire the approved design. We will use this first phase design to put together an estimated cost to build. The plan is not quite ready, but it is enough for us to gather estimates. Once all that is complete and the estimated cost approved, we go into the second phase where the plan details are added and the appropriate team pulled together to build it. A proposal to build is created and signed and then plans are submitted to the city for necessary permits. Keep in mind that the time frame can be more or less based on how large the project is and how quickly you make your decisions/selections. We can often have additions/modifications ready in as little as three weeks, with some whole-house remodels—that include additions—that have taken considerably longer. I always suggest getting started sooner rather than later. We don’t advise rushing the planning phase to meet a start time as it creates opportunities for regret. We are currently working with homeowners who hope to begin projects soon after the holidays and others who are looking at spring as a goal building date. Now is a perfect time to call for a free consultation. That way you’ll have plenty of time to get started on a plan that works for you before our schedule fills for the season.
. The web address is www.MooreRemodeling.com. A: When it comes to cabinetry, quality costs—and it counts. Depending upon your needs, and your budget, different options or features may or may not make sense for you. It’s important to know if you plan to remain in your home for several years or if you’ll be selling in the near future; that could affect some of your choices. You’ll also want to consider the usage a particular room is getting. That may also impact the quality you consider. If your budget can accommodate a “great” cabinet as opposed to a “good” one, it’s always best to spend a little more up front in order to reap the rewards of better quality for years to come. We at Moore Home Remodeling can help you determine how far up or down the quality and design ladder you should go to make sure you get everything you’re looking for. Construction – How is the cabinet put together? Does it feature a cam-lock assembly, glue and fasteners, or pocket screws? Materials – Is the cabinet made of solid plywood or particleboard? Hinge Hardware – Are the closures steel soft-close with full extension, or are they the coated roller style? Finish – Is the finish a paint or stain? Interior Accessories – Do you want a pull-out trash bin and/or shelving? Style – Will you be sticking with the simple, stock designs or opting for more designer-like features, such as inset doors or an aged look? 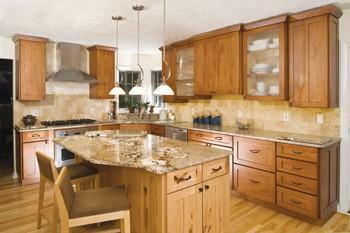 Cost – Will your cabinets be oak, cherry, or maple? Certain wood species cost more. These are just some of the factors to consider, but there are many others. Give us a call and we can help you devise a wish list of wants and must-haves to determine which cabinet type is right for your project.